Bathroom remodeling can create the bathroom you want or need! One of the most common home remodeling projects we do for our clients is bathroom remodeling. The truth is, the longer you are in your home the more chance their is that your needs, taste (or both ) change. Not to mention, bathrooms suffer from wear like every other part of your home. Sometimes they need a little attention. In the case of your specific needs, it might be that your bathroom no longer works for you. Maybe your family has grown or is smaller. Or, you’re a little older and want things to be a little more enjoyable and easier. There’s even the chance that life threw you a curve and you need to have a more functional bathroom. Whatever the reason, bathroom remodeling can help you create the bathroom that suits your taste, matches your home and works the way you need it to. What would the perfect bathroom for you look like? Would it have a modern, walk-in shower or other spa-like features, such as multiple shower heads, built-in seating and heated floor tiles? What about his and her vanities that you can sit at, a comfort-height toilet and safety features built in? Whatever your vision is, Safe Living Solutions in High Point, NC specializes in bathroom remodeling services for customers who want beautiful and functional baths, crafted with the highest quality workmanship and design. For many folks, the bathrooms in their homes are missing things that could make their lives easier. It can be for many reasons, of course. Such as, you have some specific physical needs, which make your current bathroom less than ideal. Or, maybe you have children or are a little older, and getting in and out of that bathtub is cumbersome. There also is the chance that having specific features would make it easier for you to use, such as more room, a no-step shower or a roll-under vanity. Whether you need a fully handicap accessible bathroom or just want to make yours easier and more safe for your family, we can create it for you. We do all kinds of bathroom remodeling, but we are specialists in the area of accessible bathrooms. We’ve been helping our clients n the High Point area create bathrooms designed specifically for them for nearly 20 years. Many of our customers are starting to think about what they want to have in their homes later in life. Many of them realize that more accidents happen in the bathroom than any other place in or around your home. And, as such, having a bathroom that is designed for safety and comfort could go a long way towards keeping them living life the way they want to. They are wanting a home, including the bathroom, to support them later in life. Through bathroom remodeling, you can create a more safe experience for yourself, your partner or spouse, or your parents. We can install and build the specific features that can reduce the risk of falling, making your life easier and providing some protection against accidents at home. 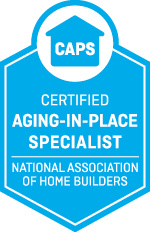 We have two Certified Aging in Place Specialists (CAPS) on staff. By combining our experience with Universal Design, accessibility and our knowledge of working with older adults, our bathroom remodeling professionals can create a beautiful bathroom for you to enjoy today and has what you need to make home life more safe later. So many of our clients are living in homes where they’ve raised families or created so many memories. Many are in communities full of friends or activities that they don’t want to leave. Maybe you’re more inclined to stay in your home and just update it to match your life, now. If that’s you, then we can make creating the bathroom you want in your updated home an enjoyable experience. At Safe Living Solutions, our we can help guide you. Our professional remodeling team will walk you through the design process and make suggestions that will ensure you are happy with the investment you make in your home. Our professional bathroom remodeling team will ensure it is done to your specifications and you’ll have a bathroom you can be proud of for years to come. So, whether you want to modify your bathroom to have specific functionality, update your existing bathroom, or even add a master suite with a luxurious spa-like bathroom, we can make it happen for you.